The material I have for posts is beginning to stack up. 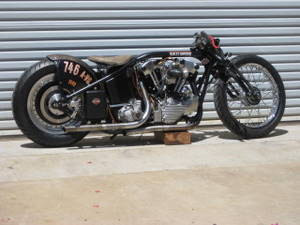 I have been too busy in the shop to post very often, despite very few interruptions as I worked through Sturgis week. I have several short items that I hope will get me back on track, and keep you the reader interested. 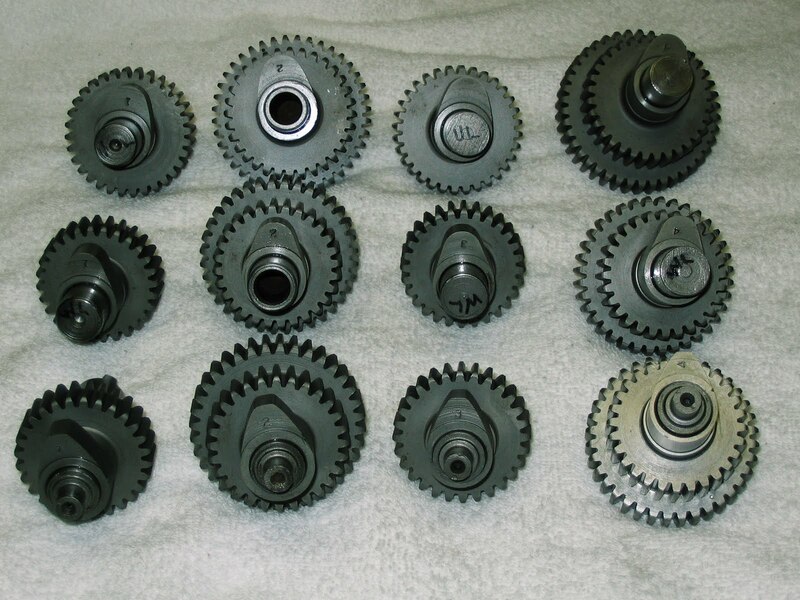 This may only be useful if you are "in the business" or do a lot of your own work, but if you have access to a lathe, it is a no-brainer. The "Old School" method of squaring a piston ring in the cylinder bore for checking end gap usually involves putting the ring into the bore, and then using one of the pistons to push it down evenly. There are only two problems with that method (that I can see). 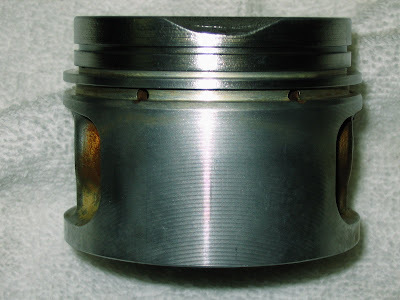 First, since the top of the piston is smaller than the skirt, it is easy to have the piston cocked a little, which will throw of the end gap measurement. The other problem, is that if your piston has a dome, then there is also the chance that the dome will not square up the ring properly. 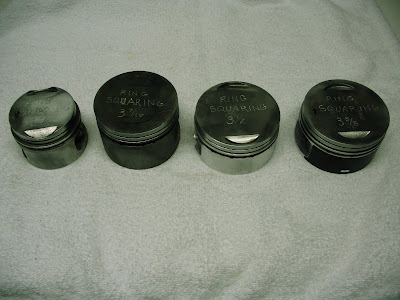 Of course, if you happen to have some junk flat top pistons laying around your shop gathering dust (and what motorcycle shop doesn't?) your project is nearly done. Simply select a piston from the next standard bore size larger than the one you need a squaring tool for, chuck it up in your lathe, and turn the top two ring lands down to just under standard bore size. De burr, wash, and you're done. By machining down the top two ring lands, when you push the ring into the bore with your new tool, the third ring land will stop on the head gasket surface leaving your ring about 1/2" into the bore, and perfectly squared up! For example, I used an 883 Evo piston cut to just under 2 3/4" for use on 45 Flathead motors. I made a 3 7/16" tool for Knuckles/Pans/Shovels from a stock 80" Evo piston, a 3 1/2" Evo tool from a 3 5/8" S&S piston, and a 3 5/8" tool from a stock 88" Twin Cam piston. In the near future, a 95" Twin Cam piston will provide the raw material for a 3 3/4" Twin Cam 88" tool, a 4" S&S piston for a 3 7/8" Twin cam, and a 4 1/8" S&S piston for a 4" . The best part is that all it should cost you is a minimal investment of time! Perhaps it is genetic. After a couple of years absence from the annual "soapbox" race as part of our local Shakopee Derby Days celebration, my grandson Max came out of retirement for this year's event. Max, seen here in the far lane, seems to have perfected a type of "body english" which seemed to aid his mid track acceleration. The hard right turn Max executed at the end of the race was also reminiscent of numerous passes from my own drag racing career when it was questionable whether I would finish in the same lane I started in. The above is from some home movies from 1985. It was originally shot with an 8mm camera ....you know, the kind you set up a screen and projector to play. Yeah, I know; the dark ages. We took our little Shovelhead drag bike out to Farmington North Carolina for the HDRA (predecessor to the AHRDA) National Finals. The good looking kid in the camouflage T-shirt is Bobby McGranahan, my racing partner and owner of the engine. The fat guy on the fast bike is me; the engine builder and owner of the chassis. Bobby was the pilot, but he always encouraged me to take the bike down the strip during test and tune to keep me enthused. His charity back fired on him though, as the following year I built a dual carb Knuckle motor to go in this same chassis, and went racing on my own. Bobby passed away several years ago, and we all still miss him. If I am not mistaken, the gentleman in the red T-shirt adding H2O to the water box is Red Roberts, the founder of the HDRA. BTW, the bike in the right lane did not break. It was not uncommon for our bike to win by that kind of margin.